Every so often something comes along that is so brilliant that you wonder why no one else ever thought of it before. The Hooded Observing Vest from Dark Skies Apparel is one of those things. 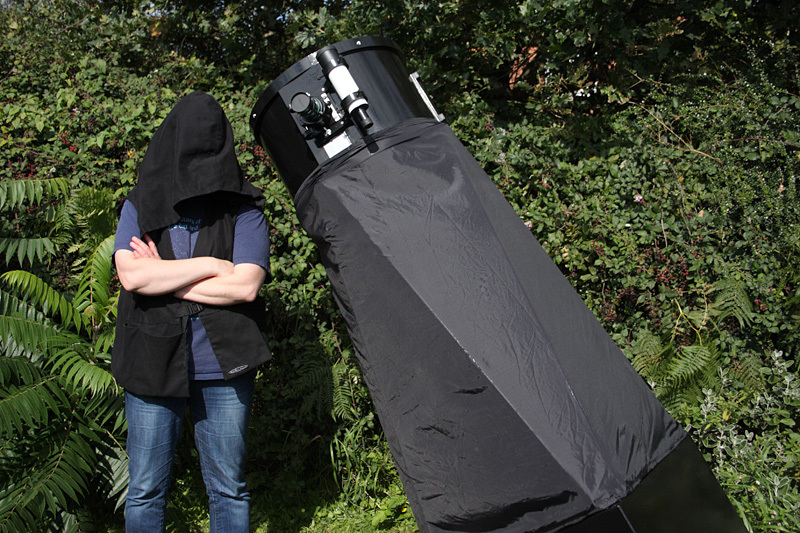 Like other deep sky observers, I put dark material over my head to block out extraneous light when observing. I am lucky as I live in a fairly dark area but it’s not perfect, there are some house lights when my aunt puts the kitchen or bathroom light on, the odd insecurity light from the house across the way and car lights coming down the hill I need to block out at times. Having some kind of hood helps you see at least half a magnitude deeper, too. 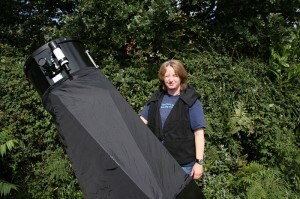 I had been using a black t-shirt, worn like a scarf then extended over my head, but this got in my way a lot of the time; however, I’d not yet found a better solution until I went to the 2010 Texas Star Party where I found Alvin Huey and others wearing an odd garment. This garment was a vest with an oversized hood and gives the wearer the appearance of someone dabbling in witchcraft when the hood is worn! While observing the first night, Alvin invited me to try his observing vest on and, the following night, I bought one from Jimi Lowrey, who was selling some on behalf of Dark Skies Apparel. 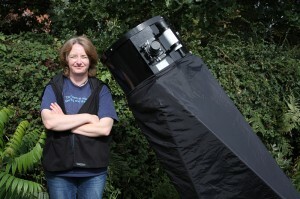 The Observing Vest is made from heavy black cotton and has three rows of deep pockets. The bottom row pockets are the largest and are ideal for holding eyepieces. You could also get a small notebook in them. The second row pockets are smaller but can hold other items such as filters. The top pocket is ideal for pens, pencils and other drawing and writing materials. The hood is deliberately oversized. 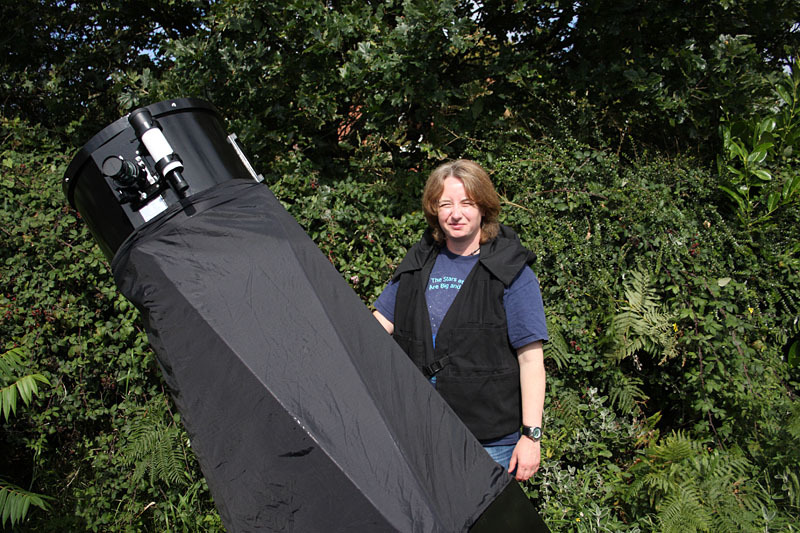 This enables the observer to put the hood over the eyepiece in order to keep out unwanted light and works a treat, much better than a t-shirt because there is more room, and much better than a towel or jacket which would slip off. The cotton material is heavy duty and is of high quality. This material will not rip or tear any time soon, unless you deliberately set out to destroy it. 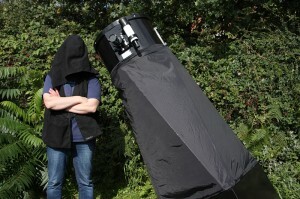 All-in-all the Hooded Observing Vest is of excellent quality and I would recommend it to all serious deep sky observers. You can order one from here: Dark Skies Apparel.